Try and ride a minecart into the . You will notice you minecart will turn. And power the powered tracks from C.
below the will NOT Light up. You can try it. I tried it. Well, I just noticed this was added to the wiki. REAL: I was testing the Powered Rail, and I got an Idea for a dispenser. Done! 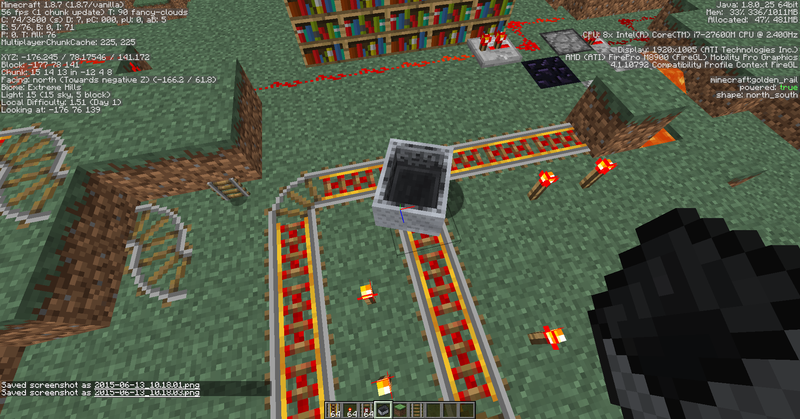 I am done with my Minecart Dispenser without Glitch Boosters as they will be removed! But I have no video recording software. I just performed the depicted test and the powered rail did NOT behave as though curved. When entering from the bottom of the T, a cart continues straight. When entering either side of the T, the cart turns according to the south-west rule. I did see the cart appear to rotate once or twice, but I think that's attributable to rendering the turn the cart takes, not from an invisible curved track. In short, the apparently straight track behaved like any other straight track when testing the pictured layout. POST IN THE RIGHT TOPICS OR CHUCK NORRIS WILL FIND YOU! OMG! THAT WORKS! Nice Call!